Free Shipping Included! 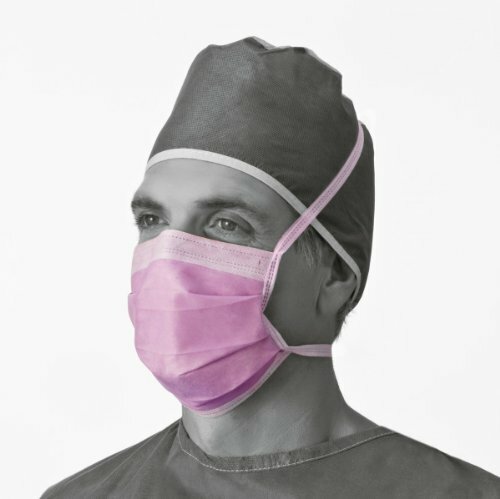 Medline NON27412 Surgical Face Masks, Fluid-Resistant, Latex Free, Purple (Pack of 300) by Medline at High IQ Business Network. MPN: NON27412. Hurry! Limited time offer. Offer valid only while supplies last. Fluid-Resistant Surgical Face Masks offer full protection against fluids at either the AS F1862 160 mmHg or 120 mmHg Fluid Resistance Levels. Fluid-Resistant Surgical Face Masks offer full protection against fluids at either the AS F1862 160 mmHg or 120 mmHg Fluid Resistance Levels. Cellulose inner facing creates a soft, cool and non-irritating environment for comfort. An anti-fog strip of comfortable, soft foam prevents eyeglasses from fogging, thus ensuring optical clarity while ties create secure attachment. BFE > 99%, PFE > 99%, AS F1862 160 mmHg / 120 mmHg Fluid Resistance.